ViaWest Group purchased this 127,264 square foot Class A- office building through a joint venture with Taconic Capital in February 2018 for $15 million ($118 per square foot) at 87% occupancy, with below-market in-place gross rents averaging $19.23 psf. 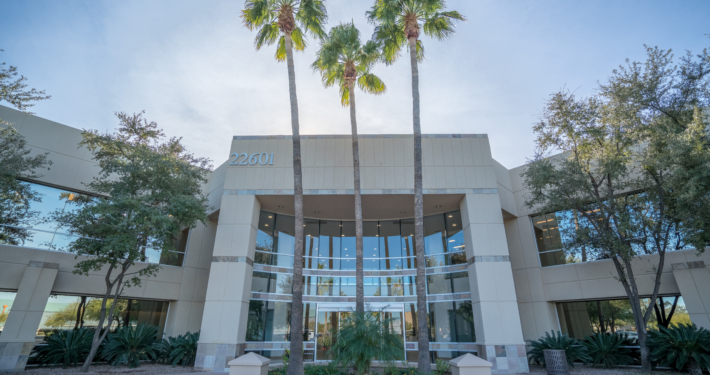 The property, located in the high-occupancy Deer Valley submarket of Phoenix, was purchased in a brokered off-market transaction in which the seller, a publicly traded company, was quietly exiting the Phoenix market and required a discreet process. We believed market rents were much higher than in-place rents, so while we executed a high-end spec suite program to attract new tenancy at the higher rent, we also navigated the sensitivity of significantly raising rents on renewing tenants through relationship development and proactive communication, resulting in 100% retention of renewing tenants in the first year. Our capital strategy focused on low upfront capital improvement cost, which made renewing tenants imperative. Within a year, four tenants had been renewed, new tenants were signed, and occupancy was brought to 100%, combining to result in a significantly higher net operating income (NOI) at the property.